Four University of Alabama football players were arrested and charged with second-degree robbery following a pair of incidents early Monday morning. Linebacker Tyler Hayes and defensive lineman D.J. Pettway were charged with second-degree robbery while defensive back Eddie Williams and running back Brent Calloway were charged with second-degree robbery and fraudulent use of a credit card. According to the Tuscaloosa News, Williams and Hayes admitted to attacking a student, punching him in the head and face and kicking him in the back and rib area while he was unconscious. They stole the victim’s backpack, which had an Apple laptop in it. Williams said the group committed a second robbery where he punched the victim in the face while Pettway and Hayes watched. Williams stole the victim’s wallet and used the student identification card to buy snacks from the vending machine in the football player’s dorm. This is the second jail stint for Williams this week. He was charged with carrying a gun without a license on Sunday. Police found the car, stopped it and searched Williams, who was sitting in the backseat on the passenger side. They found a gun in the back of his pants. He was arrested, charged and released on a $500 bond. 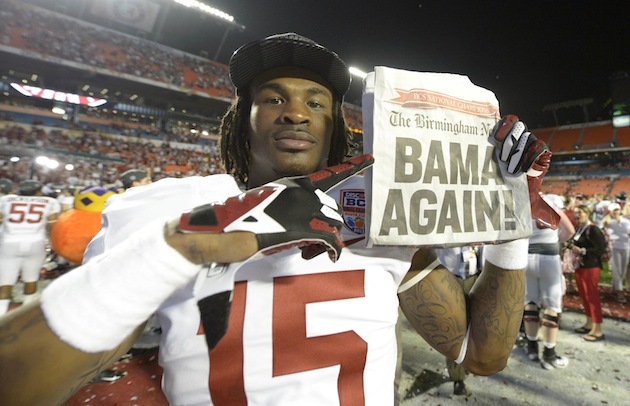 All four players were backups during the 2013 BCS National Championship game. "The young men charged are indefinitely suspended as we continue to gather information and talk to the appropriate people. The University and football program have strict guidelines regarding issues of this magnitude. This behavior is unacceptable for any student-athlete at the University of Alabama and not representative of our football program." Nick Saban's message was clear, concise and essentially said ``good riddance''' to the 4 players.